The SU1024LSE-1.7 is available in machine vision and spectroscopy formats, the high-resolution LSE-series linear InGaAs photodiode arrays have set the standard for high performance. SUI produces LSE InGaAs array products with 512 elements on 50 μm channel spacing and a pixel height of 25 or 500 μm for standard 0.8 to 1.7 μm arrays. Anti-blooming protection prevents charge flow from saturated pixels, allowing for increased intra-scenic dynamic range. These channels are >99% operable and have unmatched uniformity. 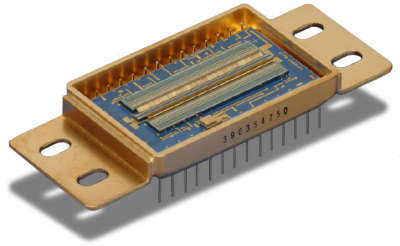 The photodetector arrays are hybridized with CMOS readout integrated circuits (ROIC) of SUI’s exclusive design to offer maximum noise immunity and sensitivity. Operating circuit designs need only provide for one analog supply and two digital control lines for optimum ROIC performance. Two separate gains are selectable with a single input. Arrays are available with thermoelectric coolers for temperature stabilization and monitoring. SUI LE-Series photodiode arrays are reliable and available in volume. Other applications for the SU1024LE-1.7 include industrial process control and inspection in agricultural sorting, biomedical analysis and thermal imaging. Square pixel for machine vision.